Cataract is a disease of slow and progressive evolution, is currently the leading cause of vision loss in the world. About 160 million people around the world suffer from cataracts to some degree. Among the population over 65 years, almost half of people have cataracts. Despite being a common cause of blindness, fortunately, the cataract is curable and can be corrected through surgery. Even patients with advanced cases of cataract can again see after surgery. In this article we will explain what the eye cataracts, which are its symptoms, what are the treatment options and how is surgery. 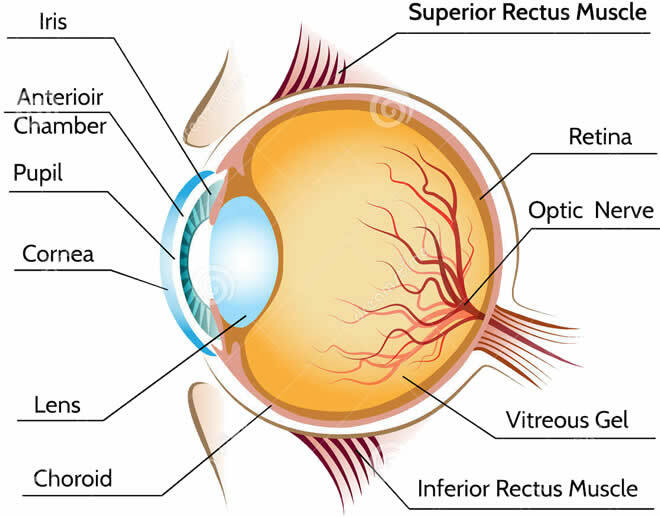 The crystalline lens is a transparent, biconvex, gelatinous, which is located just behind the iris (the colored part of the eye) and the pupil, as seen in the illustration below. 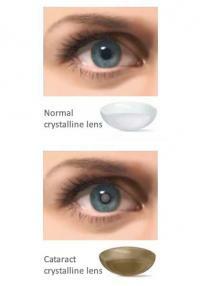 As mentioned above, the lens is the natural lens of our eyes. As it is flexible, the angle of its curvature can be changed by contraction of the eye muscles, which allows us to focus far or near objects with equal effectiveness. To illustrate the role of the lens as a lens, we can cite the case of presbyopia, also known as "eye fatigue" which is an abnormality of vision which occurs after 40 years of age and is characterized by decreased eye focusing capability objects that are very close. Presbyopia occurs due to a loss of flexibility of the lens. Already cataract is a condition that arises when the lens loses its natural transparency and becomes progressively opaque, become blurred or blurred vision. In advanced cases, the patient loses his sight completely. The lens is composed primarily of water and protein. The crystalline proteins have their own characteristics and are responsible for their clarity and transparency. With aging of the eye, the structure of the proteins changes, which causes a gradual loss of transparency of the lens. Cataracts that arises in the elderly is called senile cataract , which is the most common form. Congenital cataract: is a form of cataract which is present at birth or that develops during the first year of life. Congenital cataracts can have several causes, among the most common are diseases of genetic origin and infection during pregnancy, such as toxoplasmosis, rubella, syphilis, cytomegalovirus and herpes. Traumatic cataract: is a form of cataract occurs after a trauma of the eye. Unlike other forms, traumatic cataract is usually unilateral. Some types of eye surgery can also cause this type of cataract. Cataract radiation: is the type of cataract which arises after exposure to ionizing radiation, such as, for example, in the case of patients undergoing radiation in regions close to the eyes. Drug secondary cataracts: several drugs, if used continuously for several years may facilitate the onset of cataracts. The most common are the glucocorticoids, such as prednisone. Prolonged use of statins, drugs used in treating high cholesterol also increase the risk of cataract, but this risk is much lower than that of corticosteroids. A cataract is a slow, gradual and painless process. In the early stages it can go unnoticed. Cataracts in the vast majority of cases affect both eyes, but it does usually asymmetrically. 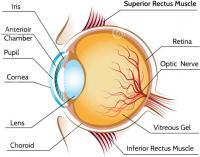 In general, an eye has a cataract in a more advanced stage than the other. The first complaints regarding cataract often the difficulty seeing in low lighting, driving vehicles at night and difficult to read cards or small letters. Worsening of an existing myopia is also a common early symptom. The need to change the degree of glasses with some frequency may be a cataract signal. With the progression of clouding of the lens, the vision is becoming increasingly nebulous and less noticeable contrasts. Other common symptoms are uncomfortable with bright lights, causing an intense glow in the vision, and complaints that the colors of objects and the environment are more yellowish, brownish or less intense. Some patients with cataracts develop double vision. In more advanced stages you can see the crystalline opacified through the pupil, which becomes greyish, like the image below. In general, the cataract takes many years to get to this point. The only effective treatment to cure cataracts is surgery. Glasses and magnifying lenses can relieve symptoms in the early stages, but to definitely fix the problem, the only option is to operate. Generally, cataract surgery is indicated when the clouding of the lens is already large enough to interfere with ordinary activities of everyday life. Ideally, the doctor agreed with the patient the best time to operate. Contrary to what happened before, when the surgical technique was undeveloped and the risk of complications were high, is no more waiting cataract reach many advanced stages to operate. If cataracts bother the patient, this is already reason enough to mark the surgery. In children, however, the behavior is different. Once the diagnosis of cataract is done, the doctor will schedule the surgery for cataracts disrupt normal development of the eyes in babies. Cataract surgery is simple and consists of removing the cloudy lens and replacing it with an artificial lens. The most modern technique of cataract surgery is called phacoemulsification. This surgery is done on an outpatient basis without the need for hospitalization, and under local anesthesia with eye drops or injection. No need to do general anesthesia. The phacoemulsification surgery is performed through a small incision of less than 3 mm in the cornea. Through this opening is part of a device that emits ultrasound waves that break the defective crystalline into several pieces. This same device is also capable of extracting the fragments of shattered crystal. After all the defective lens is removed, a new intraocular lens (IOL) is inserted through the same opening in the cornea, perfectly replacing the old natural lens. The artificial lens can be multifocal, which in addition to cure cataracts also allows the patient no longer needs glasses for near or far. The phacoemulsification lasts about 30 minutes and the postoperative period is done at home, the patient does not need to be hospitalized. At the end of the day, the patient can get back to doing their lighter daily activities such as eating, reading, walking or watching television. no special diet is not required. The patient only needs to apply the prescribed eyedrops properly and avoid physical effort or take the hands to the eyes. A mild itching or discomfort are common in the postoperative period, so it takes care not to fumble in the eye all the time. In the early days the patient can have a bandage covering the operated eye. After cataract surgery, vision returns gradually, but usually in the early days, visual acuity is already very good. It is common medical reassess the patient the day and once or twice during the first month. Usually for security reasons, the ophthalmologist operates one eye at a time. The interval between the two operations depends on recovery of the former. As the complete healing of the surgery takes 4 to 8 weeks, this is usually the interval between the two operations. Some patients, however, operating the second eye after just one week, if the first surgery has elapsed as well.